There are times you just need a classic caesar salad, but vegan of course. Caesar dressing is rich and creamy, tangy and savory, and loaded with umami. And it traditionally gets these flavors from egg yolk, anchovies, and parmesan. Vegan recipes abound with various ways of getting these rich flavors and textures. And while I pretty much find all of them delicious, I wanted to take a more direct approach with making a vegan caesar dressing. To veganize caesar dressing, consider the function of the non-vegan ingredients. So to start, caesar dressing is made by an emulsification of egg and oil. If that sounds familiar, it’s because it’s essentially mayonnaise. 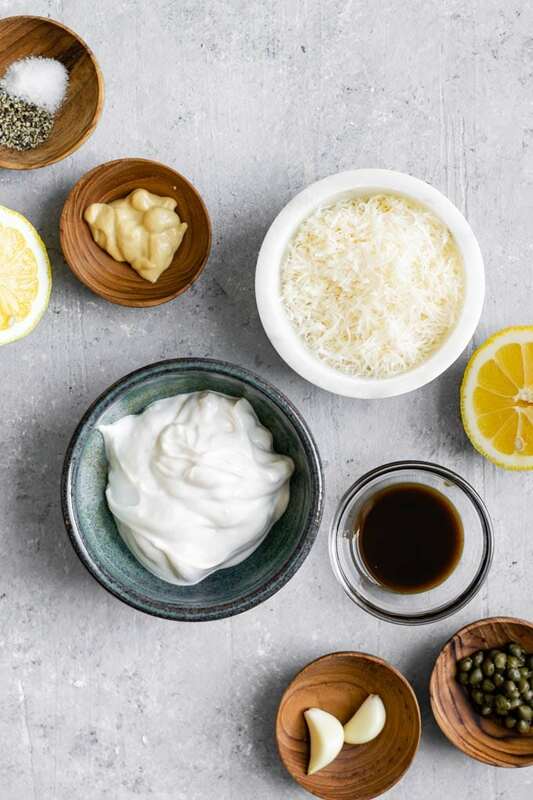 And in fact many recipes recognize this and make the short cut of using mayo instead of making their own emulsification. Luckily for those of us who don’t eat eggs, vegan mayo options abound. It’s a simple swap and you get that rich and luscious, but also light and airy base for your dressing. Next we look to the parmesan. For those of us who do or did love dairy cheese, parmesan was probably pretty high up on that list. It’s a deliciously savory cheese, and provides a lot of flavor in small quantities. I went vegan before all the advances in vegan cheeses, and parmesan was one of the cheeses I missed the most. But these days, thanks to companies like Violife and Follow Your Heart (there are more, but these are the two biggest I know of!) we have some amazing plant based parmesan. My favorite way to make this dressing is using these vegan store bought parmesans. This brings the complexity of parmesan cheese to the dressing without the cow. That being said, I also enjoy this dressing made with nutritional yeast for some old school vegan parmesan. A cashew or other nut and nutritional yeast parm substitute would also work really well (I detailed a recipe for a pecan-cashew parmesan in the notes of this roasted garlic and sweet potato mac and cheese recipe). The last big swap we need is for the anchovies. Now, I’m not a big fan of the idea of fishy flavors in my food in general, and certainly not in my salad, so I keep this one simple and use capers for a little of that extra oomph. Capers are tangy, briny, and even a bit lemony–complementing the flavors of the dressing really nicely. They pack quite the punch of flavor, and will jazz up any recipe they touch. They aren’t going to be an exact flavor match to anchovies but that’s ok (and even a bonus) by my standards! Everything else is pretty straight forward. We have garlic, lemon juice, mustard, salt and pepper. And last but not least, we add Worcestershire sauce. Now this is typically not a vegan ingredient, as most contain anchovies. But, you can buy vegan (and gluten free!) Worcestershire sauces, or do a quick search to find your own homemade vegan Worcestershire recipe. Don’t skip the Worcestershire sauce. It’s got a lot of complexity that it adds to our caesar dressing! And that’s it. 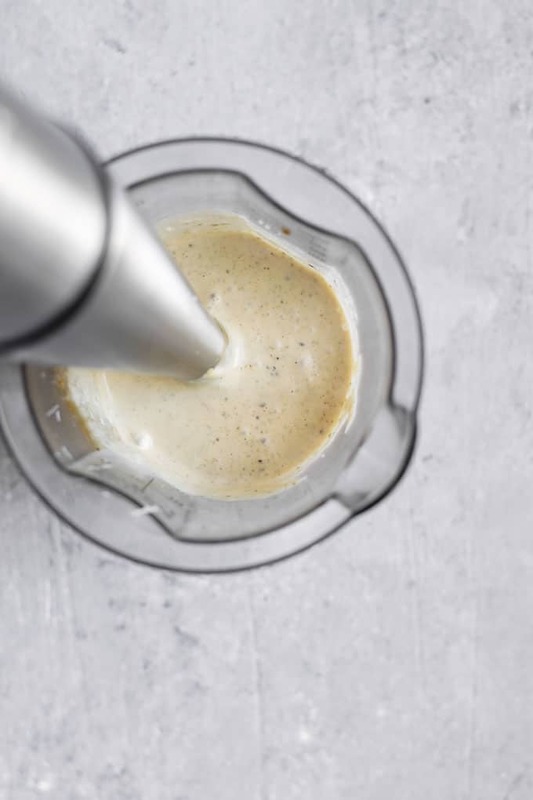 This vegan classic caesar dressing only needs 9 ingredients and maybe 5 minutes of your time, most of which is grabbing the ingredients! When it’s this easy and this delicious, there is no need to buy! Caesar salads are some of the easiest salads to make. We’ve already covered how easy it is to make the dressing. 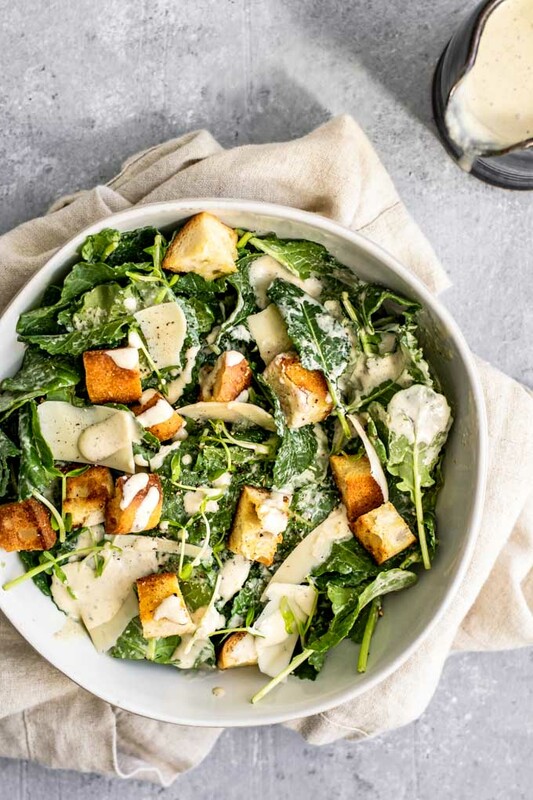 But the salad only has 4 ingredients: greens (typically romaine but I’m a big fan of kale caesar salads), croutons, shaved parmesan, and of course dressing. 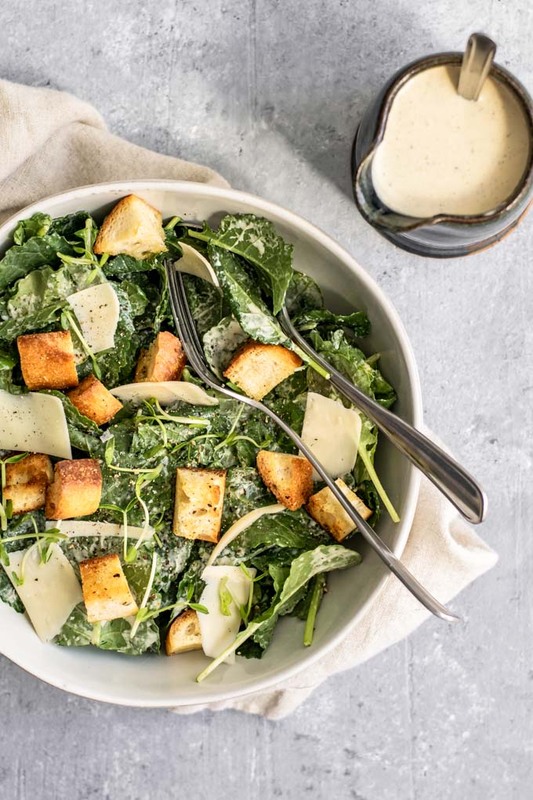 Homemade croutons add a lot to this otherwise simple salad, and a big batch can last you through a week of salad eating! Make them or buy them with gluten free bread for a completely GF salad. For the parmesan, Violife sells its vegan parmesan in wedges which you can shave, or sprinkle on any vegan parmesan or nutritional yeast as you like! You can stray from the classics and add more ingredients to this salad like carrots, cherry tomatoes, or chickpeas. 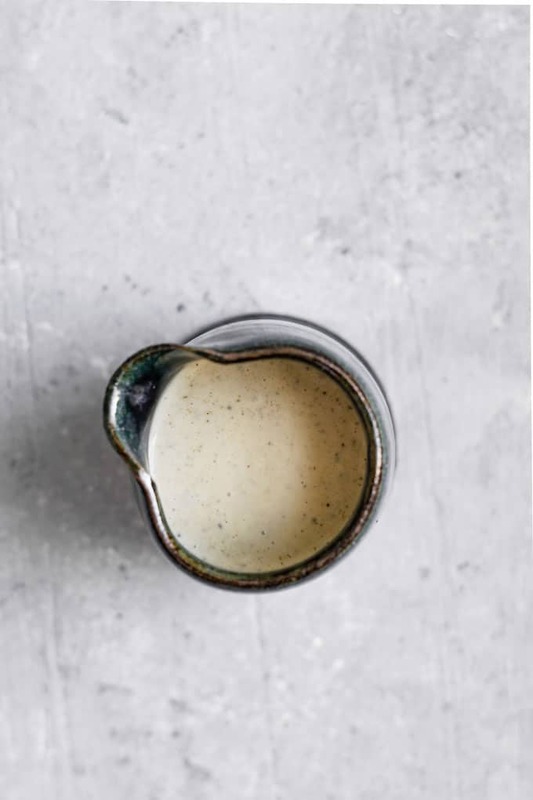 Whatever you add, doused in that delicious vegan caesar dressing it is 100% going to satisfy! 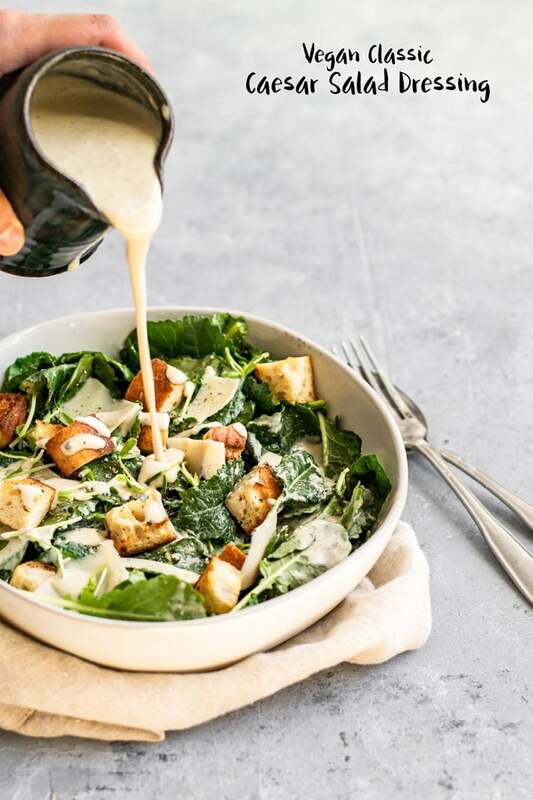 If you make this vegan classic caesar dressing, leave a comment below and rate the recipe on the recipe card. And please share your photos with me on Instagram, tag @thecuriouschickpea and #thecuriouschickpea. 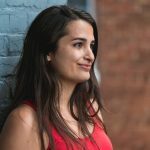 I love seeing your recreations! 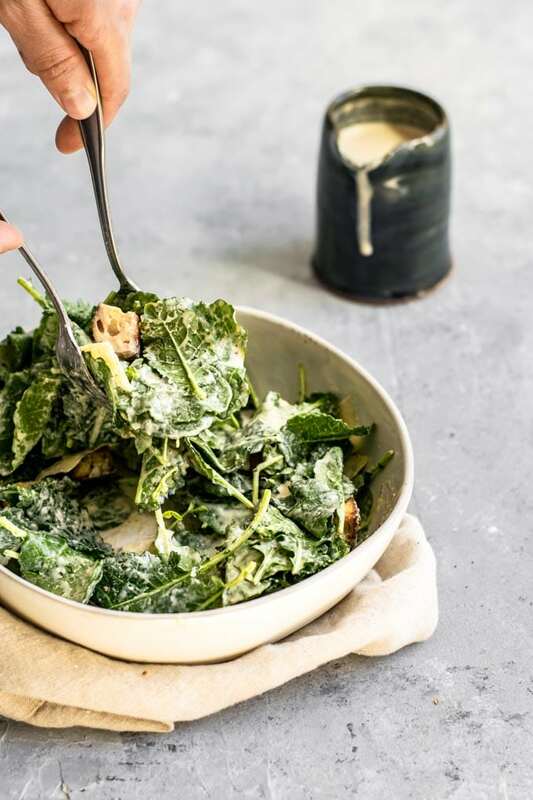 This classic caesar dressing is made vegan in this quick and easy recipe. This flavorful dressing is rich and creamy and made with just 9 pantry friendly ingredients. 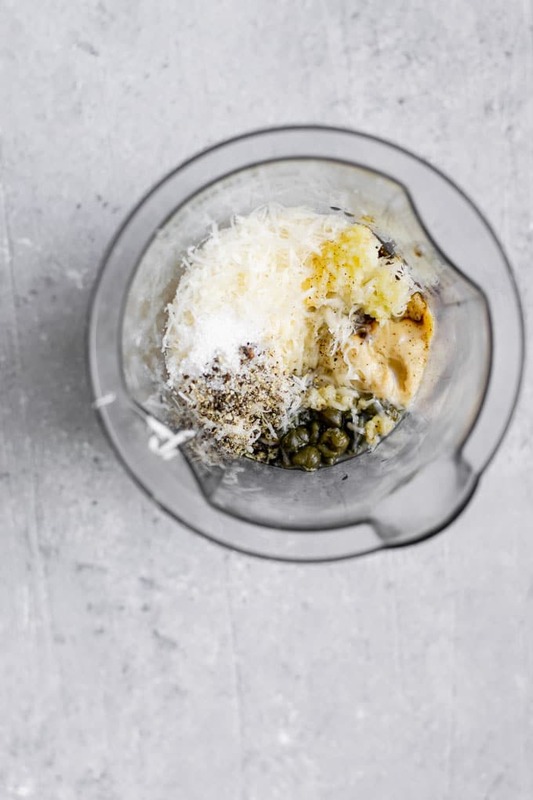 Combine all ingredients and blend together with an immersion blender or upright blender. Store in sealed container in fridge until ready to use. Homemade Croutons: Toss 3 cups cubed or torn French baguette or country loaf with 2 tbsp extra virgin olive oil, 1/4 tsp dried thyme, 1/4 tsp garlic powder, 1/4 tsp salt, and freshly ground black pepper. Bake in a single layer at 375 ºF for 8-10 minutes or until golden and crispy. Will take less time for very stale bread and more time for very fresh bread so keep a close eye on it as it bakes. 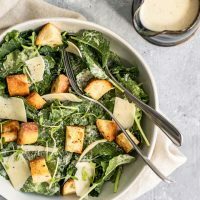 Serve with romaine or baby kale, croutons, and shaved vegan parmesan for a classic caesar salad.